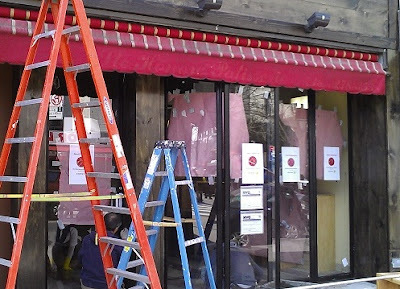 While shopping on Ditmars yesterday, I noticed that the old St. Honore Patisserie space is being transformed as we speak. The newcomer on this block will be a Japanese style noodle bar that's currently being worked on. Seems like a good idea, as I don't know of a place like this existing in Astoria yet, but the only issue may be all the other Asian-style eateries located on that 3-4 block stretch such as Watawa (currently being expanded, yay! ), Spiced Diner (Indian/Chinese fusion), Sakura and many more. Let's see how it does...I'm rooting for it. Will let you know once I have more information but wanted to keep you informed that it's in the works. I can't wait as ramen is my favorite. Can't find it in Astoria. I can't wait to try it as we can't find any good ramen in Astoria.